Just as Stanford wished to bring the idiom of song to the Evening Canticles, so did he also experiment with the notion of song as a sacred genre. 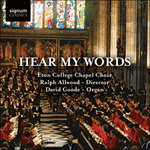 In moving one step beyond Dvorák’s Biblical Songs, Op 99, for voice and piano (published in 1895), Stanford’s six Bible Songs, Op 113 (first performed by his fellow Irishman and future biographer, Harry Plunket Greene), for voice and organ, are designed principally for the church rather than the concert room. The more ambitious solo ‘verses’ in S S Wesley’s anthems (one thinks particularly of ‘Thou, O Lord God, art a thing that I long for’ from Let us lift up our heart) spring to mind as a precedent and it was repertoire Stanford both knew well and greatly admired, but the more elaborate conception of the organ part (which has more in common with his orchestral songs) together with the scale of gesture and tonal organization tend to suggest the idea of a miniature cantata rather than a song. 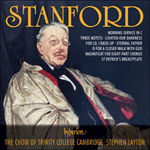 As if to reinforce this cantata-like impression, Stanford composed a set of Six Hymns (sometimes known as ‘short anthems’, published by Stainer & Bell in 1910) which could be individually appended to each song. Based on well-known hymns of the day (in a manner often deployed by others such as Charles Wood and Basil Harwood), their intention, in an almost Lutheran, not to say Bachian, manner, was to comment theologically on the scriptural meditation of the preceding song whose theme is made explicit in the title. The general texture of the organ accompaniment is also derived from the material of the song which can be heard clearly in the interludes between verses. A Song of Freedom, a setting of Psalm 126, tells of the Jews’ return out of captivity, praying for and prophesying future prosperity. From the Psalm’s six-verse structure Stanford constructs two strophes which end with the same refrain, ‘whereof we rejoice’. 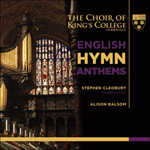 The song is concluded with the first two verses of John Milton’s Let us with a gladsome mind to the anonymous tune ‘Monkland’, a hymn that affirms the faithfulness of God in its two-line refrain ‘For his mercies aye endure, Ever faithful, ever sure’. Psalm 121 (‘I will lift up mine eyes unto the hills’), which talks of the security of the godly who put their trust in God’s protection, forms the basis of A Song of Trust. 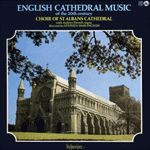 Constructed in two distinct sections, the first part of the song in 9/8 evokes a pastoral atmosphere while the second (‘The Lord shall preserve thee from all evil’) is marked ‘Quasi arioso’, is hymn-like in its simple phraseology and is used as the accompaniment for Purest and highest. For this short anthem the words are taken from Robert Bridges’ translation of the Latin hymn ‘Amor Patris et Filii’ in his Yattendon Hymn-Book (No 28); the tune is Orlando Gibbons’ Song 22 on which Stanford had also founded his Prelude No 2 of the second set of Six Short Preludes and Postludes, Op 105, completed in February 1908. The greatest pathos is reserved for A Song of Hope, an appropriately dark setting of Psalm 130 (‘Out of the deep have I called’), where the Psalmist in distress professes his hope in God and exhorts Israel to do the same. 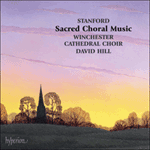 Perhaps sensing its greater emotionalism, Stanford also orchestrated the song for strings and organ, though this arrangement remains unpublished. From this darker atmosphere emerge the comforting strains of In thee is gladness, the words of Ludwig M Lindemann and the tune by G G da Caravaggio (1591). The prophetic Messianic text of Isaiah Chapter 11 (‘There shall come forth a rod out of the stem of Jesse’—made famous as the Fourth Lesson of the Christmas Service of Nine Lessons and Carols) is used for A Song of Peace, a sonata structure in which Stanford symbolically introduces the tune ‘Veni Emmanuel’ as the second-group idea. The same material subsequently permeates Pray that Jerusalem, the melody taken from Playford’s Psalms (1671) and the words from the Scottish Psalter. The opening thematic idea for A Song of Battle recalls similar material from the Finale of the Fifth Symphony and Prelude No 6 of the Six Short Preludes and Postludes, Op 105. Stanford’s organization of Psalm 124 is, as with A Song of Freedom, in two strophes with a coda (‘Our soul is escaped’) in the tonic major, and it is this latter material in the major mode that underpins Praise to the Lord, the Almighty, the tune of which is from Praxis pietatis melica (1668) and the words from Neander’s hymn. The text of A Song of Wisdom is, perhaps not surprisingly, taken from the book of Ecclesiasticus (Chapter 24), the most extensive portion of Israelite wisdom literature in the Bible. Here, as a conclusion to the six songs (if they are to be construed as such), is a poetical discourse on the virtue of wisdom and the Lord as its bountiful source. Stanford’s textual adaptation gives a freedom to his through-composed musical design: an opening paragraph is framed in E flat major (‘I came forth from the mouth of the Most High’), after which a more tonally dissolute section (‘And I took root in a people that was glorified’—verses 12 to 17) leads to the climax of a top B flat (‘Come unto me, ye that are desirous’—verse 19). In the third section the growth of the stream to a river, and the river to a sea, aptly mirrored in the imagery of the organ accompaniment, is likened to the limitless bounds of wisdom. The last eleven bars recapitulate the first two lines of text, though this time the mood is one of triumphant acclamation. The last of the ‘Hymns’, O for a closer walk with God, taken from the Scottish Psalter (1635) with words by William Cowper, is the most original of the six. 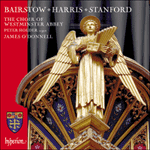 Using three verses (1, 3 and 5) from the original five, Stanford constructs a fantasia around the melody in which the diversification of harmony, phrase-length, register and counterpoint becomes increasingly intricate. This is especially delectable in the last verse where the words ‘Calm and serene my frame’ are set to what must be one of Stanford’s most enchanting phrases.